Paris was great! Our final day featured a look around The Louvre before catching a ride on Eurostar back to England (through the Channel Tunnel, a modern Wonder of the World, from what I've heard) where we'd rest up before going into London the next day. Unfortunately that plan was tossed out the window somewhere in the middle of France where our train broke down. "My Eurostar Hell!" should have been the headline on The Sun the next day because we were trapped on the train for nearly 10 HOURS!! We didn't get home until four in the morning, by which time we decided that London would have to wait one more day. A rail-strike had been adverted earlier in the week, so we had planned for two days in London, but this had cut it down to one. Anyway, the next day we finally got into London. 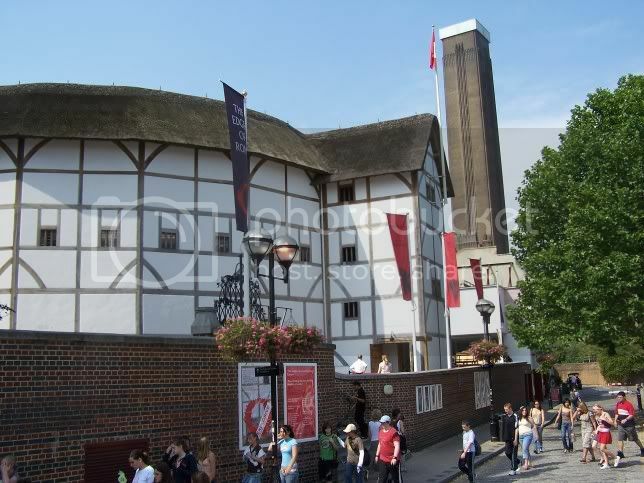 Our first stop in London was Shakespeare's Globe Theatre, a replica of one of orginal theatres where plays were performed in the late 1500s. The Exhibit inside is educational (although they definately need to get air-condition installed!) as well as the tour that takes you inside the open-air theater. TC made the obvious comment to me that it looks just like the theater in Shakespeare in Love, and I couldn't argue with that. You see that tower behind the theater? That's part of the Tate Museum of Modern Art. We tried, but after viewing displays on one level, we gave up and left with the opinion that it was filled with pretentious crap! Oh, there was a piece of work by Jackson Pollock that was interesting, but most everything else was crap. Don't get me started on the paintings of Eminem, just don't, please. 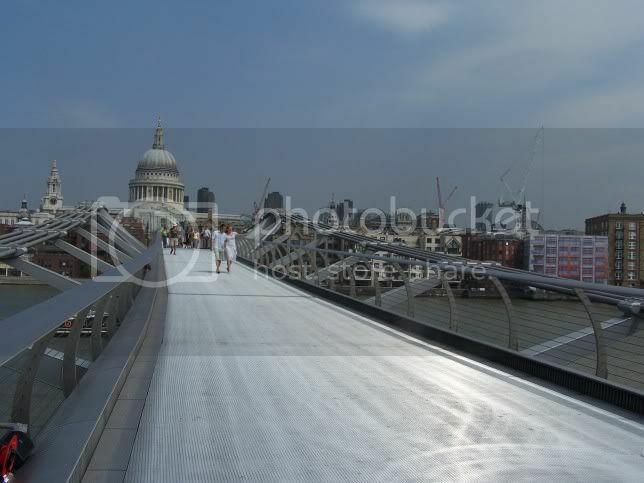 The best thing about the Tate Modern was the view where you could follow the Millennium Bridge over the Thames straight toward St. Paul's Cathedral. (yeah, I'm as shock that they have a website as you are! Welcome to the 21st century, I guess.) The thing I like best about this picture is the couple in the middle pointing to something out of the shot. I couldn't have gotten a better shot had I posed them that way. After a visit to TC's work place, I think we had lunch at Amato, and took a look around Forbidden Planet before stopping into British Museum. 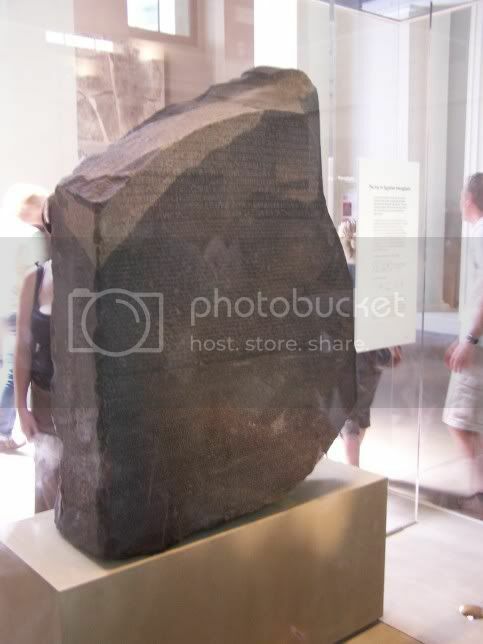 One of the more popular items on display is the famous Rosetta Stone. The Rosetta Stone was a declaration praising an Egyptian pharaoh written in 3 languages/scripts that were being used in Egypt at the time. One was hieroglyphic which was the script used for important or religious documents, a second was demotic which was the common script of Egypt, and the third was Greek which was the language of the rulers of Egypt at that time. Despite the openness of many of the rooms, the museum was quite stuffy on that warm and humid day, making the study of ancient artifacts less exciting than it sounds. 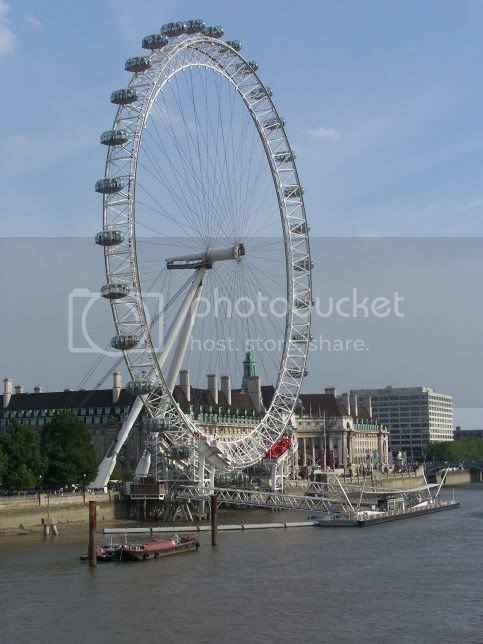 The final high-light of our day in London was a ride on The London Eye. Built to celebrate the millennium in 2000, the award winning construction (which was only suppose to stand for a few short years), has now become a fixture in London's skyline. The ride was incredibly smooth and the views were amazing. Plus they had a/c installed, an added plus! 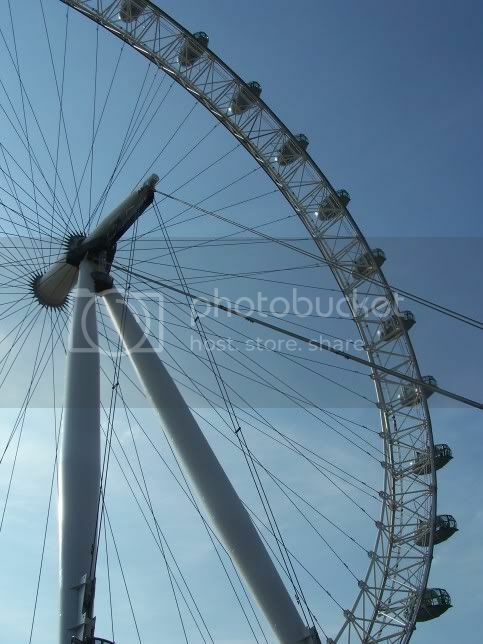 This last picture looking up at the Eye is one of my favorites. There were a lot of things I wanted to do on my trip that I didn't (I think I was just overwhelmed by the entire exprience), but that just gives me more than enough reason to go back in the not-too-distant future.